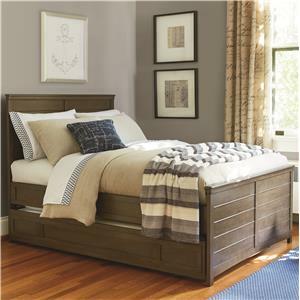 Bed Shown May Not Represent Size Indicated. 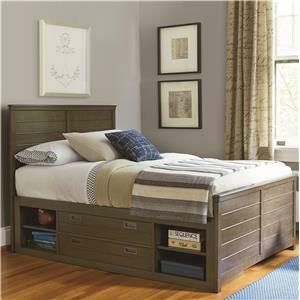 This casual panel bed with storage unit is finished in a warm greystone color with visible grain and a Bronze accent on the headboard. 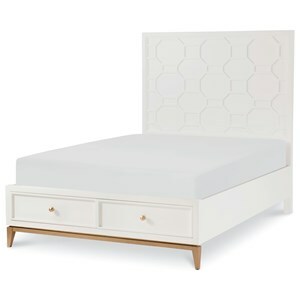 The storage unit can be used on the left, the right, or both sides of the bed and features two adjustable shelves and a large drawer with a removable divider. 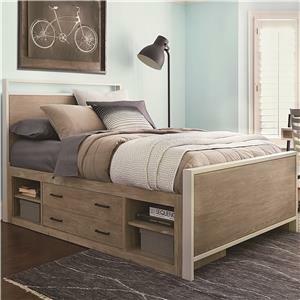 Your child will love this bed and storage unit's trendy visible grain, neutral finish, and storage capacity for years to come. The Scrimmage Full Panel Bed with Storage Unit and Bronze Accent on Headboard by Smartstuff at Howell Furniture in the Beaumont, Port Arthur, Lake Charles, Texas, Louisiana area. Product availability may vary. Contact us for the most current availability on this product. 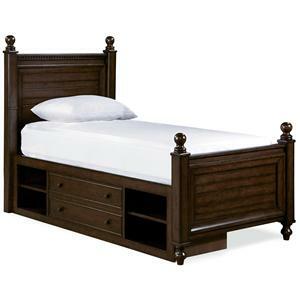 7371061 Storage Unit w/Side Rail Panel 1 76" 76" 20"
7371950 Bed Side Rails 3/3 4/6 1 2" 76" 7"
7371240 Footboard 4/6 1 57" 2" 21"
7371140 Panel Bed Headboard 4/6 1 57" 2" 48"
Handles & Hardware Oiled Bronze metal handles. Drawer / Shelf Construction English dovetail construction, soft and self closing full extension drawers, and metal on metal drawer glides. Complete your youth's bedroom with this warm and casual collection that is perfect for a boys or girls bedroom. Made with function and safety in mind, this youthful collection features English dovetail joinery, soft and self closing full extension drawers with metal on metal glides, and anti-tip kits throughout. 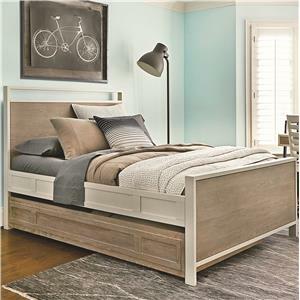 Loved by your child for years to come, this trendy collection is finished in a neutral Greystone color with visible grain and oiled Bronze metal accents. The Scrimmage collection is a great option if you are looking for Contemporary Casual furniture in the Beaumont, Port Arthur, Lake Charles, Texas, Louisiana area. Browse other items in the Scrimmage collection from Howell Furniture in the Beaumont, Port Arthur, Lake Charles, Texas, Louisiana area.